My wife didn’t hesitate when our daughter asked if she wanted to go pick strawberries. Like most folks, we love just-picked berries. If we still lived in Ohio, the berries likely would need several more days before they would ripen. 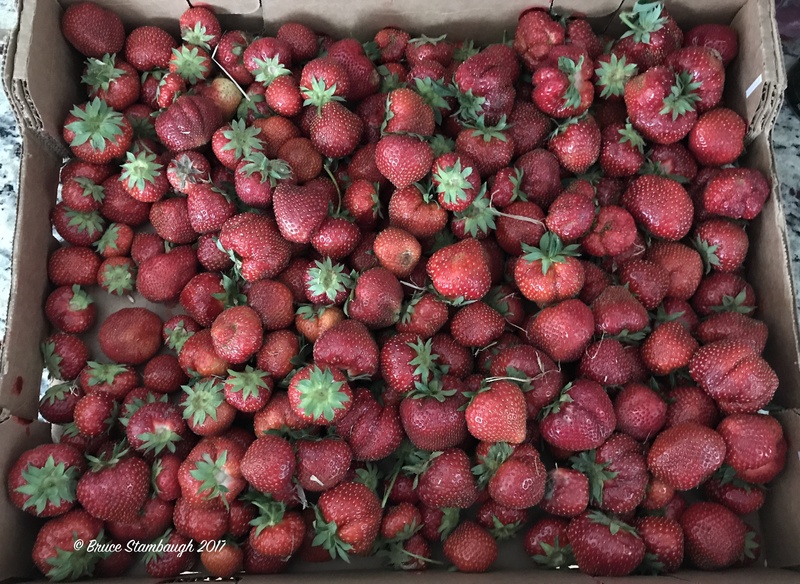 Having the opportunity to pick and enjoy red, ripe strawberries this early in the season was a reality check for us. We really were in Virginia! And for the record, the berries were delicious. “Welcome to Virginia” is my Photo of the Week. Gotta ask: where did you pick yours? The birds are getting mine. Maybe you could photograph that! Ha. Neva and Carrie picked them at a farm near Broadway. [ Smiles ] Oh, I love strawberries and great picture too! Beautiful! I have so enjoyed your posts and sharing so honestly about your move and the transition from a home of 38 years to a new adventure of being closer to ACTIVE schedule of grandchildren. Have to admit I even shed a tear or two. The honesty was so real. Thanks so much, Judith. Thanks, too, for following along. Great photo. We moved from California to Virginia to be also be near our grand kids. We live in Culpeper. We are so happy and blessed to be here. Good for you, Ginny. I’m glad you liked the pic. I’m jealous! Here in Canada it will be over a month before we even think of picking strawberries! Looks so good. I very much enjoy your posts; the lovely photos, and your writing. You know how to use words, and it’s always interesting. Well, don’t be jealous, Hazel. Just use this photo as positive anticipation of when you do get to pick your own up north. I’m glad you enjoy the pictures and stories. I appreciate you letting me know. Great photo Bruce. I can almost smell them!!! Next month I will be heading to our local family run farm here in western Pa. I get there in the morning when they are bringing in the first pick of the day. The strawberries are either covered in early morning dew or warm from the sun (depending on the weather). I bring them home and begin the process of making them into jam. It’s one of my favorite things to preserve. Your photo makes me long to hurry the days! Thanks, Pamela. Enjoy your strawberry days ahead.